A Signature Issue: Did Wright Help Hines Get on the Ballot? A story written by VTDigger’s Greg Guma about Burlington Republican mayoral candidate Kurt Wright’s “unusual political alliance” had the chattering classes, well, chattering over the weekend. Better that than the Grammys and "Downton Abbey," I suppose. Hines and Hartnett are also friends. They first crossed paths at Burlington High School decades ago and have stayed in touch. In January, Hartnett helped Hines obtain enough signatures to get her name on the ballot by putting her petitions out near the cash register at his business, according to a witness. That nugget was sandwiched between two other compelling observations: that Hines could serve as a spoiler in the race — potentially helping Wright win the election — and that Wright last week publicly offered Hines a job if he was elected. Taken together, the inference was clear: Wright’s campaign helped Hines get on the ballot to bolster his own chances, and Hines’ reward would be a plum post in his administration. Problem is, that’s not the whole story. Acting on the same tip, I too spoke with Guma’s anonymous witness last Wednesday. That person saw Hines drop off a signature sheet and clipboard with Hartnett at the Short Stop Mobil station he manages on North Avenue. The candidate and campaign manager had a brief, friendly chat, according to the witness. When I followed up with Hartnett, he confirmed — and contextualized — the exchange. He said that he had previously run into Wanda on the campaign trail and had heard from her that she was short on signatures. “I said, ‘Wanda, if you’re leaving sheets in stores, you’re welcome to leave them in my store,’” Hartnett recounted. In a separate conversation, Hines told me much the same thing. After learning that 40 of the 170 signatures she turned in to city hall were duplicates, belonged to unregistered voters or were otherwise ineligible — candidates need 150 unique signatures to get on the ballot — Hines mentioned that fact to Hartnett in a chance encounter. “David was the one who extended the olive branch on that one. I said, ‘yeah, why not?’” she told me. Importantly — and this is what the Digger story missed — Hines never returned to the store to pick up the signature sheet. “As a matter of fact, I didn’t even use that sheet. I didn’t need that sheet,” she told me. So did the Wright campaign orchestrate a vast conspiracy to place Hines on the ballot? If you’re a cynic — or a supporter of Democratic candidate Miro Weinberger — you might think so. If you take Hartnett and Hines at their word — that this was just a case of one old friend helping out another in Burlington’s small political world — you might not. I don’t have any idea one way or the other. What I do know is this: lacking anything close to hard evidence, I chalked the episode up to a matter of interpretation. And in the midst of the political silly season, didn't think it merited reporting. (Photo by Paul Heintz. 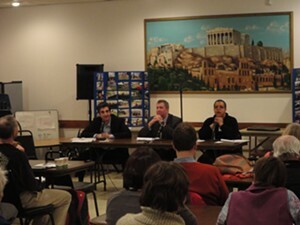 Pictured left to right are: Weinberger, Wright and Hines at a recent Ward 6 forum at the Greek Orthodox Church).